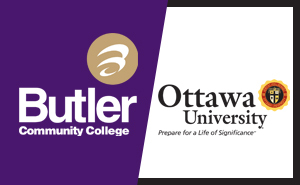 Butler Community College Partners with Ottawa University, Bringing an Affordable Business Degree to Butler County for the Fall of 2017. Butler County Community College students who have completed their Associates Degree can complete a Bachelor's Degree from Ottawa University completely online. Ottawa University may offer a degree in Business Administration in a cohort format on Butler's Andover campus with enough student interest! Please reach out to Angela Fitzwater (angela.fitzwater@ottawa.edu) to find out more about this option! “It’s exciting to be able to be with the students when we take the next step,” said Jared McGinley, a business professor at Butler. McGinley, along with Ottawa professors and adjuncts will teach several of the bachelor-level classes. This program is designed for the working student in mind. Classes will meet at the Andover campus from 6 to 10 p.m. one night a week. Each class will meet with a professor for two hours a week for eight weeks and online for a similar amount of time. In this way, each student will complete four classes per semester. All students will go through the two year process as a “unit” – taking the same sequence of classes. After students receive their associate’s degree at Butler and are accepted into the program, they will take five more classes at the community college. At this point, they will become Ottawa students, but all classes will be offered at Butler’s Andover campus. To be a part of this program, students must graduate from Butler with a degree in business administration. However, they could have received their degree several years prior.